Former Texas A&M quarterback Johnny Manziel is a one-of-a-kind type athlete that only comes along once in a blue moon. Comparisons between Manziel and other quarterbacks, past and present, just don’t line up well. The one guy that ‘Johnny Football’ most resembles, style wise, is Fran Tarkenton, the former great Hall-of Fame quarterback for the Minnesota Vikings. As a matter of fact, Tarkington himself agrees with the analogy. “Nobody really played like I played. This kid plays like I did more than anybody else. He’s the closest thing I’ve seen to myself. Russell Wilson has some of it. But Manziel has those similarities even more so than Russell. And then ‘Tark’ said the most amazing thing, “Manziel is a quarterback savant.” That’s pretty heady praise from a guy who left the NFL holding many of the league’s passing records when he retired in 1978. Tarkington was also well known for his unorthodox scrambling style and the ability to improvise on the spot. After winning the Heisman Trophy as a freshman with the Aggies, something no other freshman had ever done before, Johnny Manziel was once again nominated for the prestigious award in his sophomore year, quite an achievement for a guy who was competing for the starting quarterback job when new head coach Kevin Sumlin arrived at the beginning of the season. But Manziel took the Aggies into the SEC with style and grace and gave the established teams of the Deep South fits in their first year of competition. 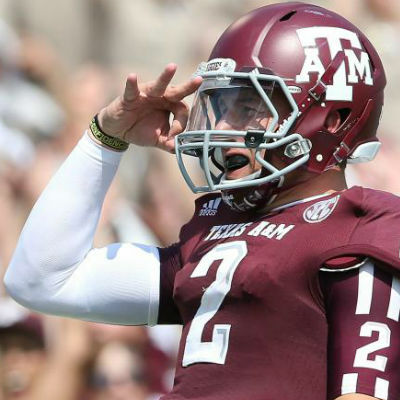 Under the SEC spotlight “Johnny Football”…as local fans began to call him down in College Station, has become one of America’s most popular, and controversial, sports heroes. Speculation reigns supreme over where Manziel will end up being taken in the 2014 NFL Draft which he declared for at the end of his sophomore year at Texas A&M. The Houston Texans have the first pick in this year’s draft and already billboards are appearing around Houston directing the Texans to pick Johnny Manziel. It does seem like a logical choice and a great fit. Manziel’s presence on the Texans team will practically guarantee sell-outs for every home game for some time to come. He is a local hero in a state where hero worship has a long standing tradition.